It was a cool vacation.. we spent like 8 days there. Landed at Fra airport and from there we've purchase a twin pass ticket for 5 days and valid for one month. it costs about 280 Euro for two person. From Fra bahnhof we took the train that take us straight to Wie our main destination. The weather was perfect it was not too cold. We spent the first 5 days every morning heading to the bahnhof that takes only 30 minutes walking and from there to other destinations. The first day we went to Kolon (using ICE train 2 hours from Wie). The second day we went to Bonn (Via ICE train 3 hours from Wie). The Third day to Frankfurt main (half hour) and then to Rhein River (30 minutes). 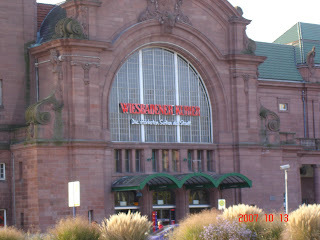 We went to mainz and to Dusseldorf ( 4 hours period from Wie via ICE train) it was the best destination as there where many shopping malls since it was the biggest city.